Right now, I’m sat with the team trying to find words to sum up this whole crazy experience; however, we are still in too much shock to think of any. This has been a complete and absolute whirlwind of a journey that we are all so incredibly grateful for each day. We have been daydreaming about Detroit, from the ride to the airport, to touching down in America, right up to walking into the arena for the first time. We can’t wait to be battling it out in the qualification matches and meeting teams from all over the world who share our interests. It all started with us sat around a table assigning roles for a competition; at that moment we had limited knowledge about. All we knew was it would require a lot of effort to achieve success, but we were definitely prepared to work for it. Once roles were assigned we soon got to work, making sure we met all the criteria for the robot, the engineering notebook, and the social media videos. We also spent an extremely long amount of time vigorously looking through the rules to be sure we understood everything we needed to do. As the competition drew closer nerves definitely increased. Gradually, more and more hours were spent perfecting the whole project making sure every area was up to full strength, followed by a difficult night’s sleep the evening before, with no idea what lay ahead of us the very next day. Then the day came. An early seven o’clock start for the team, we were definitely tired but filled with nervous excitement. We headed to our bus, where we filmed our opening video of our journey to the competition and a massive team photo (for which we won five Micro:bits!) Once we arrived at the competition, we immediately arrived for robot checks to ensure that our robot fit the requirements. Before we knew it, it was qualification matches, however, our first match didn’t quite go to plan as we forgot to turn our robot on! We managed to stay calm and composed, and in our second qualification match we managed to learn for our mistakes, by actually turning on the robot for our next qualification matches. After our qualification matches we found ourselves in a promising 13th place. So then came alliance selection. We started making connections and hoping for an alliance, seeing as we didn’t secure a top 7 place, but thankfully Andromeda (team 008) came asking us if we could lift, so we agreed to run some tests, and thankfully everything went to plan and sure enough they picked us for their alliance. With alliances selected it was time for the finals. 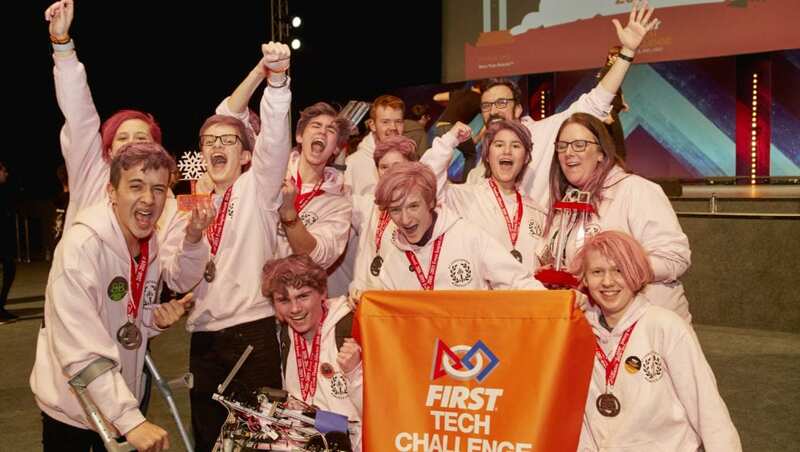 Thankfully with our newly developed lifting technique we manage to win our semi final match now it was down to the rest of our alliance, and against the odds they pulled through and with utter gracious professionalism we advanced to the grand final! We gave it our all in the final, but unfortunately it wasn’t meant to be and the other team came out on top. However, it was an absolute honour to come runners up to such a class team, and whatever the outcome we went out with our heads held high. So we thought it was all over. We sat down for the awards ceremony, a little disappointed not to come away with a win and not really expecting anything but secretly hoping for something. After a few awards our name wasn’t called, until it was time to collect our runners up medals. It was such a buzz going up as we collected our medals and it was such a proud moment for all of us. We sat down on our seats to watch the next award reveals, still excited about our medals until we reached the Inspire Award. Not really expecting anything, our name was called! It took a few seconds, which felt much longer, to process what just happened. With our hearts pounding we ran to the stage to receive our award and celebrated like crazy, embracing each other and cheering with excitement. After an assortment of photos and interviews, we made our way home with our medals and trophy at hand. We made our way home absolutely ecstatic with our win. WE’RE GOING TO DETROIT! On a more serious note, we’d like to thank our alliance members, particularly Andromeda for being so graciously professional and an absolute pleasure to compete with. We’d like to thank everyone at the competition, the referees the Game Changers and our fellow competitors for providing such an enjoyable environment. Also a huge thanks to the judges to putting their faith in us and providing us with a fantastic opportunity. Also to ARM for sponsoring the event, so all in all thank you to everyone for such an enjoyable experience. Next stop Detroit!